In the fallout from House of M and following the surprise film-noir hit Madrox, a new mutant team is forged! 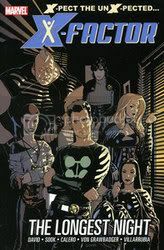 X-Factor is an investigative mutant agency that includes Madrox, the Multiple Man; Guido, the Strong Guy; Wolfsbane, the shape-shifter; Siryn, the chorus girl; Rictor, the living earthquake; and Generation X's Monet, the pompous witch. Drawn together in the heart of District X, this rag-tag band of heroes has a lot of answers to find, and fast! Collects X-Factor (2005) #1-6. A pretty solid introduction to the characters for new readers, and a pretty good start for the series as a whole, X-Factor is written in a film-noir style with an art style to match. The team, based out of District X, the former "mutant town" until the events of House of M negated the X-gene in almost every mutant on Earth, wants to know what happened and why. And who is Layla Miller, and how/why does she she "know stuff" and why doesn't she want X-Factor to learn the truth about the Decimation? Who is Singularity Investigations? So many questions in such a short time for a new series, and yet I was OK with that and want to go back for more.